Designed by Richard Butler, Illustrated by Paul Hill. 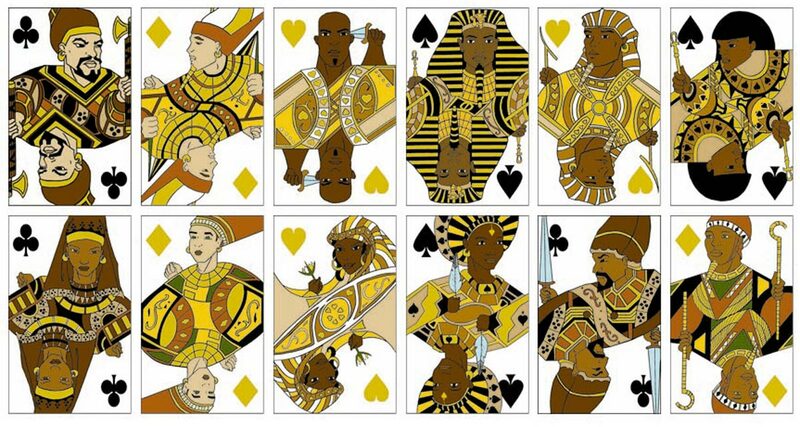 The deck was made specifically for Alpha Phi Alpha Fraternity, Inc., the first African-american college fraternity, for their 2000 convention. With the exception of nods to the two largest AA sororities, there exists no non-Alpha-related symbolism. The Ancient Egyptian theme of the deck directly relates to the rich significance of that period's symbolism within the fraternity. 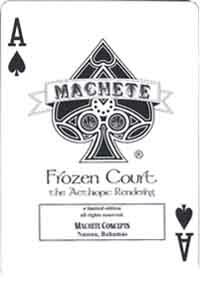 The deck has 52 cards + 2 jokers plus an explanatory booklet, and is poker-size. Featuring a custom court, custom jokers, and a special Ace, the heart and diamond pips are gold instead of red. Decks are numbered and registered. The spades suit represents the classic "Black & Gold" family (2 parts of which are no longer in existence). 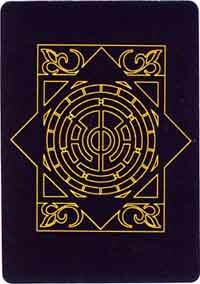 The King represents the classic Alpha Pharaoh as it states in the booklet. What is not stated is that the Queen of Spades represents an Alpha Angel (fraternity "little sister"), which is why she has a halo design incorporated into the headgear. She has seven regular spades adorning her vestments and an eighth heart which is inverted to resemble a heart and golden ("Alpha Angels have hearts of gold"). The Jack of Spades represents an Alpha Aspirant (known by various names but mainly as Alpha Men of Tomorrow). He is regarding an ankh (Egyptian symbol of life and wisdom). His vestments bear a half-light half-dark triangle, representing his current stage. This theme of half-in-darkness, half-in-light tied in nicely with the one-eyed requirement. The Queen of Clubs is a nod to the Delta Sigma Theta Sorority. Her appearance is meant to suggest the "classic" delta appearance, and she has 13 clubs in her hood, as a nod to 1913, the founding date of the sorority. DST is normally linked with the Omega Psi Phi fraternity. An inside joke (for organization members) of making the Queen of Clubs represent DST is that clubs are also known as "puppy-feet", and the Omegas are widely known (and self-referenced) as Que-dogs). 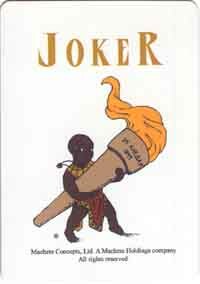 Other African themed decks reviewed on this website include: "Pharaoh Palmier Poker".